Hey Smiley fans! Sabrina here! 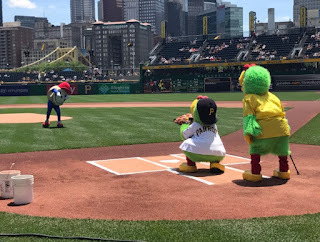 On June 18, Team Smiley got to enjoy the day at PNC Park’s Pirates Kids Zone! Smiley and the rest of the team were on scene to help pump up all of the Pirates’ fans before the big game by sharing smiles and cookies, of course! 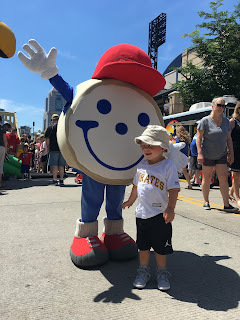 Smiley and his friends, including Rhino from the Pittsburgh Zoo & PPG Aquarium, had a blast decorating cookies, dancing to the beat of the street musicians’ tunes, and bouncing in the inflatable Pirate Parrot bounce house! After getting fans excited out on Federal Street before the game, Smiley went inside the ballpark to throw the first pitch to his friend, the Pirate Parrot! Smiley can throw one impressive curveball, that’s for sure! All in all, it was an exciting and eventful day for Team Smiley! 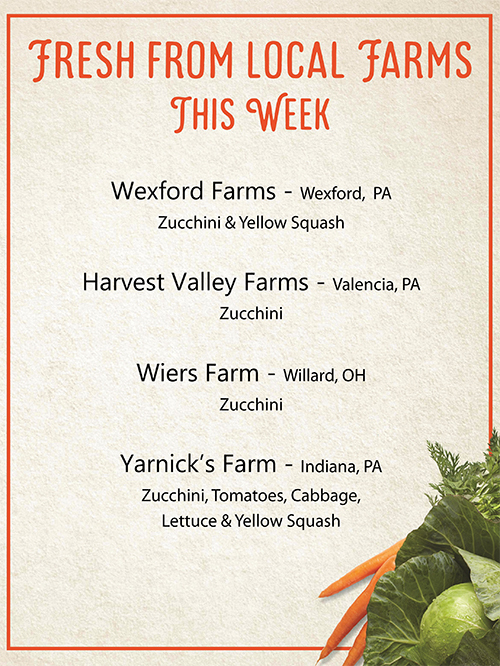 Click here to see where we’ll be popping up next and follow us on Twitter and Instagram! Hi everyone! Emmie here from Team Smiley! 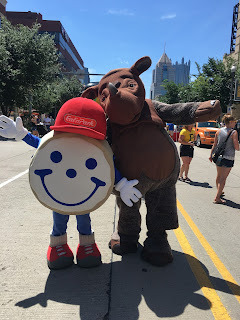 On June 11, Smiley and the team traveled to the Carnegie Library of Pittsburgh in Oakland to attend their 17th Annual Summer Reading Extravaganza. The event helped to kick off this year’s reading challenge, which is tasking western Pennsylvania residents to read more than 180,000 books this summer! 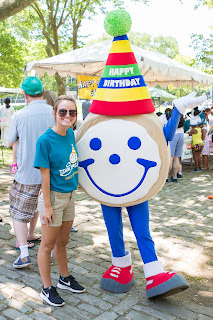 This was also a very special event for Smiley as he celebrated his birthday with hundreds of his friends! Everyone sang to Smiley and shared some delicious birthday cake with him. Smiley was so excited to greet his friends and appreciated all of their birthday wishes! Smiley and the team had a great time at the Reading Extravaganza! 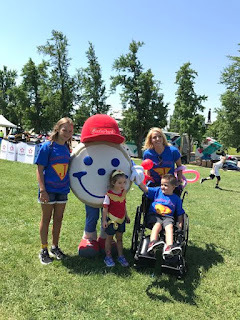 It was so much fun celebrating Smiley and sharing cookies with the community. Click here to see where Team Smiley will be next or follow us on Twitter and Instagram! Hello Smiley friends – Josie here! On June 3, Smiley and the team had the opportunity to go to The Walk for Children’s Hospital at Flagstaff Hill in Schenley Park. 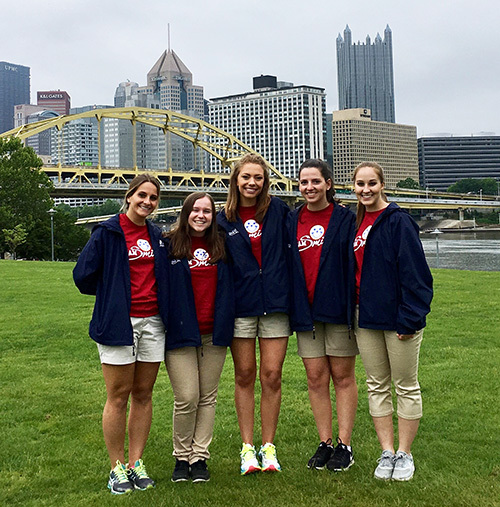 The walk had over 4,000 participants and raised over $787,000 for the Children’s Hospital of Pittsburgh of UPMC! To kick off the walk, several children were featured in a patient champion ceremony parade. This parade signified the great strength and courage of the children who have been or are currently being treated at Children’s. Below is a picture with Smiley hanging out with the leader of the parade, Jimmy! Smiley loved meeting Jimmy and the rest of his family. After the walk, Smiley gave out lots of hugs and high fives to congratulate all of the kids. 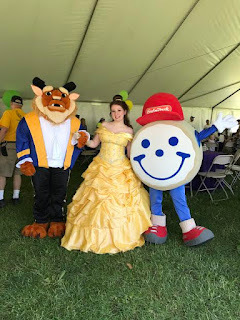 He even got to spend some time with his friends, Belle and the Beast! Together, Smiley and the team had the best time spreading some smiles for a great cause. Who knew that June could be so hectic?! From pro hockey and basketball playoffs to vacation plans to graduation parties galore, there’s barely a minute to spare! 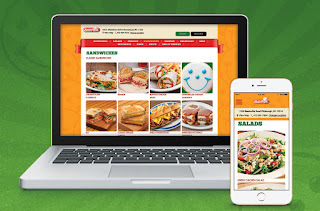 When it comes to your dinner plans, make things quick and easy with Eat’n Park takeout. 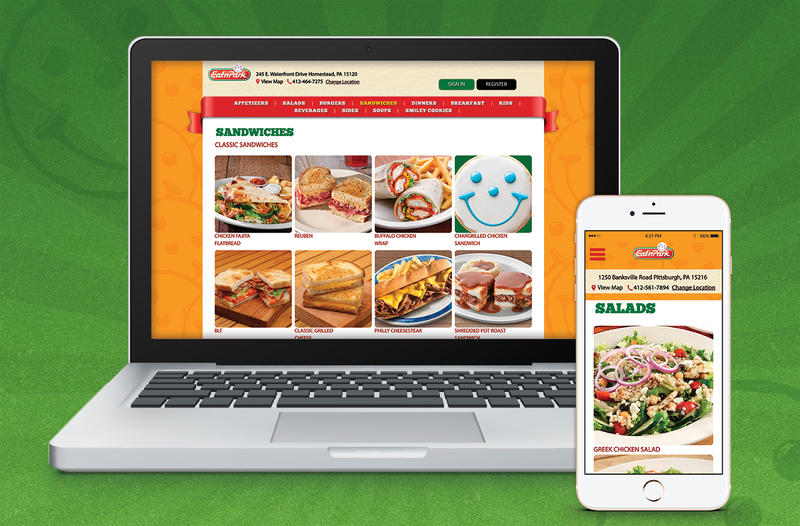 Getting takeout is stress-free when you place your order online! Plus, for the next week, you can enjoy some sweet savings when you try it out! To redeem this offer, simply enter the coupon code "JUNE" during checkout when you place your order online. Coupon code expires June 12, 2017. 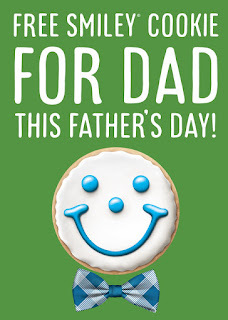 Valid for Eat’n Park restaurant online orders only. Not valid for phone-in takeout orders, or for dine-in. Not valid at our Belle Vernon location. Summer is here, and the fun is just beginning for our newest interns: Team Smiley! This enthusiastic crew is about to start their summer-long journey across the tri-state area, where they’ll be visiting fundraisers, festivals, races, and other community events from now through the fall. Where Team Smiley goes, fun follows. 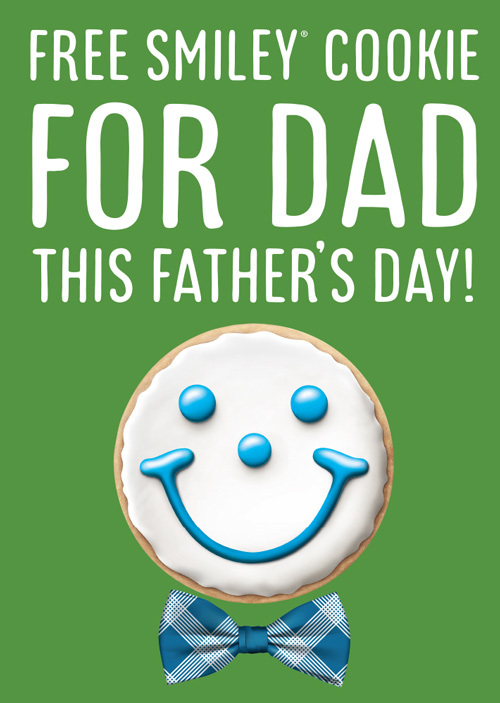 Click here to see when they’ll be visiting your neighborhood, then stop by with the family to meet Smiley and enjoy a free Smiley Cookie – or even decorate one yourself! All summer long, you’ll be able to read about Team Smiley’s adventures here on our blog. And, if you happen to cross paths with them at an event, be sure to stop by and say hello! You can even check our Photo Gallery to find your photo! So, you probably want to know a little more about these fresh new faces. Luckily, we’ve got the scoop. Read on! Team Smiley 2017: (Left to Right) Josie, Allison, Emmie, Kelly, and Sabrina. Hi everyone! My name is Josie and I am a senior at Washington & Jefferson College majoring in Business Administration with a special emphasis in Entrepreneurial Studies. I am so excited to be a part of Team Smiley this summer! As a native Pittsburgher, I am looking forward to spreading smiles both within and outside of the surrounding communities. In my free time, I enjoy playing sports (Soccer is my favorite!) and hanging out with my family and friends. Picking my favorite Eat’n Park meal is difficult, but you can never go wrong with the Pot Roast Sandwich and a good ol’ cup of homemade Chicken Noodle Soup. 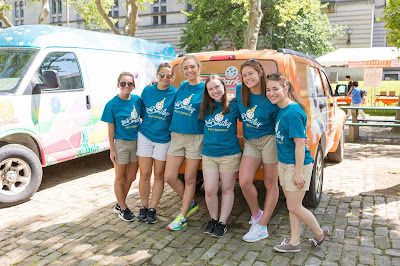 This summer, I am excited to hang with my Team Smiley fam and have plenty of fun experiences with Smiley! Hey, smiley friends! My name is Allison and I’m a senior at the University of Pittsburgh where I am majoring in Media and Professional Communications with certificates in Corporate and Community Relations and Writing for the Professions. On a regular day, you can find me exploring the neighborhoods of Pittsburgh and discovering new restaurants with good friends. My favorite Eat’n Park menu item is the Fried Ravioli… I can’t get enough of it! One day, I hope to travel through Western Europe, as I am incredibly interested in Spanish culture and have taken Spanish for a total of eight years! I am ecstatic about spending my summer spreading smiles as a member of Team Smiley and know that this will be the experience of a lifetime! Hi everyone! My name is Emmie and I am a senior at Chatham University, where I am majoring in Marketing. I am really excited to be a part of Team Smiley this summer to help to spread smiles throughout our community! In my free time, I love running, going on spontaneous trips, discovering new music, and spending time with my puppy, Ricky. (He’s 13 but he’ll always be a puppy to me!) I am always looking forward to my next traveling experience. Some adventures on the top of my bucket list are to see the Northern Lights, safari through Tanzania, and to live in Maui, Hawaii. No matter where my travels take me, I always look forward to coming home to Pittsburgh and of course, stopping by Eat'n Park for my favorite summer meal - Chicken and Strawberry Salad. I can’t wait to adventure around in the Cookie Cruiser with Smiley and the team. We definitely have a fun and memorable summer ahead of us! Hey everyone! My name is Kelly, and I am a sophomore at the University of Notre Dame studying Marketing with a minor in Design Thinking. 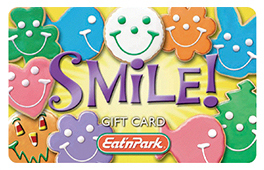 I am a huge foodie, so I am looking forward to trying all kinds of new Eat’n Park menu items this summer. My current favorite is the Strawberry Waffle (It’s so good!). I also enjoy road trips, singing in the car, and hiking/adventuring with my family and friends. On my bucket list, I would love to visit South Africa and become fluent in another language. 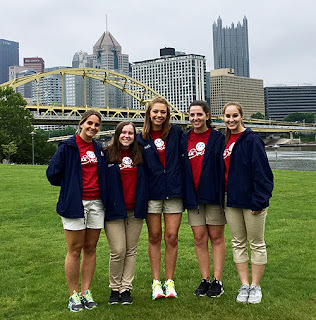 I love taking photos and videos to capture life’s best moments, so I am super excited to document my Team Smiley experience as we explore the neighborhoods of Pittsburgh, make new friends, and share smiles with the community! Hey, Smiley fans! My name is Sabrina, and I’m a junior at Kent State University. I’m pursuing a degree in Managerial Marketing with minors in Public Relations and International Business. I love hanging out with friends and family, playing sports, reading a good book, watching my favorite shows on Netflix, and spreading smiles, of course! If I had to choose my favorite Eat’n Park meal, I’d pick our infamous Soup, Salad & Fruit Bar – I like to have options! A place I’d love to travel to in a future summer is Greece. 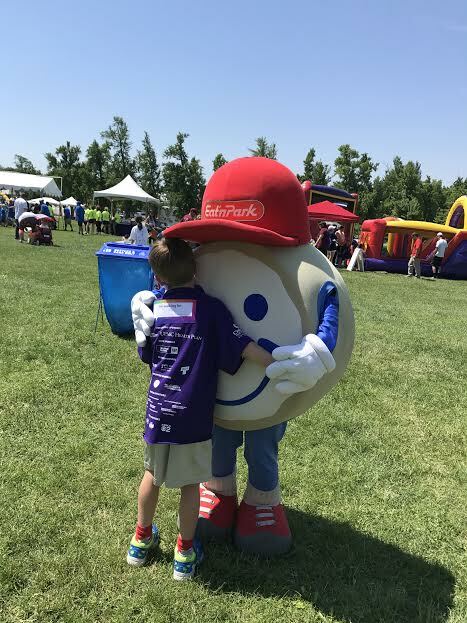 This summer, however, I’m looking forward to traveling around with Smiley and the rest of the team to share cookies, smiles, and good times with our fans! 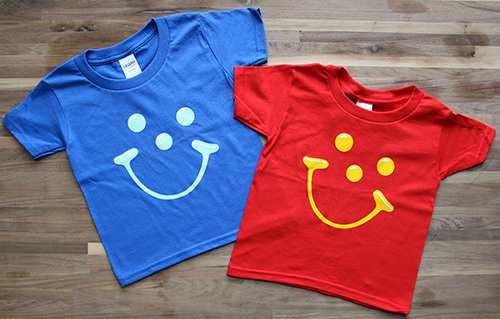 Start your summer off in style with our new Smiley merchandise! Read on to learn more about where you can find these cool new items! 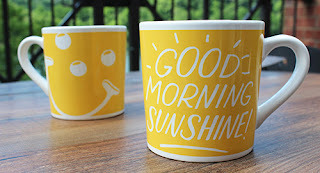 Rise and shine… it’s smiling time! Our new “Good Morning, Sunshine” Ceramic Mugs are the prefect way to help you wake up on the right side of the bed and get your day off to a great start. You can find these mugs at all of our locations for only $6.99! Make sure your kids have a smiley summer with our new Smiley T-Shirts! 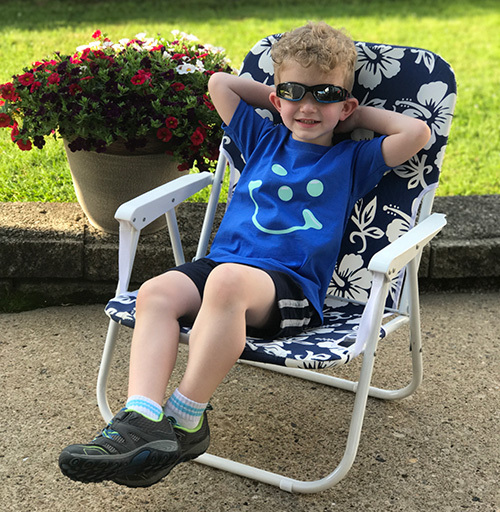 Available in two different color combinations, these shirts are sure to keep up with all of their upcoming summer adventures. Pick one up today for only $7.99!